Today, one of my dreams came true, and I say that without exaggeration: a piece of mine, from Inch magazine, is featured today on Poetry Daily. I found out about this a while ago but didn’t really believe it was actually happening until I saw it today, and I’ve had to look at it again and again to make sure that I’m not just dreaming. I mean, I’m not, right? You can see it too? 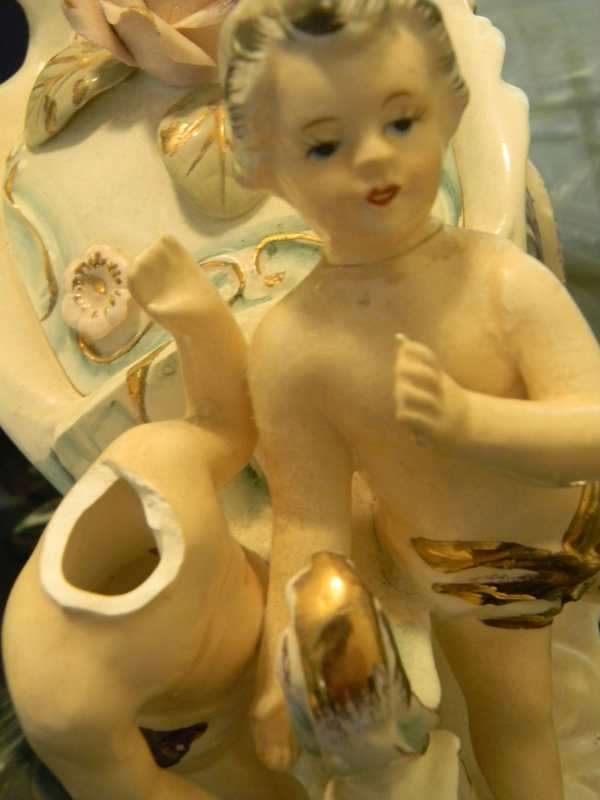 Here’s a picture of the beheaded cherub. I miss it, still. I thought I’d write a short blog entry about the piece, since I’m always curious about the poems that pop up on Poetry Daily and, well, like, everywhere that poems tend to pop up. I won’t tell the whole story behind it because a.) I already did that, and b.) then where will the mystery be? Suffice it to say that the story behind this involves a huge move, which is a new beginning, and a huge break-up, which is, of course, an ending. Besides the relationship, a few things were broken during or missing after the move: a couch cushion, my bicycle, and the head of a cherub on this terrible and beautiful planter my grandmother had used as storage for cotton balls. It was a strange time, a time when beginnings were muddled with endings, and I could hardly tell the difference between the two anymore. Flash to September of 2012, over a year later. A friend and I had just finished a stint on The Grind (explained beautifully here by Grind founder Ross White) and were following it up with a submissions grind. We promised each other that we’d send out at least one piece a day. One Saturday, I was poking around for places to submit short essays and I came across Press 53, (which, as it turns out, published a remarkable collection by fellow Grinder and all-around amazing poet and person, Shivani Mehta — Useful Information for the Soon-to-be- Beheaded) and then Press 53’s Tumblr, with their weekly 53-word story prompt. The prompt for that week was to write a 53-word story about moving. I read the prompt and the rules and then promptly shut down my computer and headed to Hobby Lobby for some emergency crafting supplies (the emergency, as always with Hobby Lobby, was just that it was Saturday, and they’re closed on Sundays, which always sends me into a crafting/quilting/crocheting tail-spin — what if I need very fine glitters on a Sunday? It happens more often than one would think). As I wandered around trying to figure out why there were so giant zebra-striped flowers, I found that my mind was working on a poem. When I got home, I wrote it: and word count showed me that it was, miraculously, 55 words. I cut two, and submitted it. Boom. Of course, the micro-essay (though I guess now I should probably call it a prose poem) was rejected. I revised and sent to another magazine. Rejected. Repeat. Rejected. Then, I saw a call-for-work for an all-micro-essay issue of Inch, one of my favorite magazines, and I sent to that. Miraculously, it was accepted — and so began the road to Poetry Daily. I’m especially happy that this is the poem that made it, since Inch is a journal I really love and a journal that shines light on oft-ignored micro-forms, and since they were willing to give this triply-rejected piece a fourth chance. Sometimes, I’ll end up with a poem or essay that just feels like a gift. It feels like a well-made thing, though I don’t feel like its maker. This poem/essay was just such a thing: I hadn’t intended to write about this part of my move — ever, really — and I didn’t set out to focus on the beheaded cherub. But there it was, and then it was on the page, called into being by forces which didn’t seem entirely under my control. I suppose, when I think about it, it does make sense that I wrote this poem at this time. It was a time when everything seemed to be changing, again. My relationships changed, my friendships changed, my health changed and therefore my body changed, and therefore my world and the way I lived in it changed. I didn’t make a move, but the world around me moved. It was a time of muddled beginnings and endings, and I again couldn’t tell which was which. It was the beginning of a moment of great change, from which I am only now starting to emerge, to look around, and to assess what was damaged beyond repair and what remains. And this, I suppose, is the greater gift, the greater dream come true: to have a poem that acts like a lens and focuses on what damage is, and what beginning and ending, for me at least, really means.